Pietro di Cristoforo Vannucci, known as Perugino (ca 1448 - 1523) was a painter of the Umbrian Renaissance. He had two important workshops: one in Florence and one in Perugia. He had a deep influence on Italian art and was the master of Raphael. 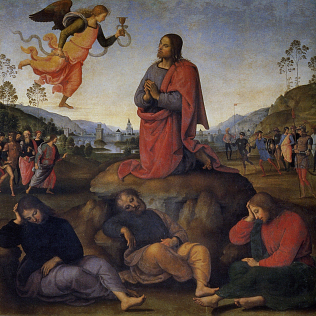 The Uffizi Gallery hosts some works by Perugino, including his Agony in the Garden. In this painting by the Umbrian artist, an important episode taken from the Gospel is represented. At the center of the painting and at the top of a triangular pattern, there is Christ. An angel offers him a cup of wine. At the base of the painting, three apostles sleeping, while Judas Iscariot and the Roman soldiers are approaching from the two sides. The order and symmetry in the arrangement of planes and characters give to the work an air of calm, despite the tragedy of the represented moment. The landscape in the background is inspired by the northern Europe art, while the ranks of trees takes are characteristic of the Umbrian painting school. At the Uffizi Gallery there are also the Pietà and the Crucifixion.